In June 1792, amidst the chaos of the French Revolution, two intrepid astronomers set out in opposite directions on an extraordinary journey. Starting in Paris, Jean-Baptiste-Joseph Delambre would make his way north to Dunkirk, while Pierre-Fran ois-Andr M chain voyaged south to Barcelona. Their mission was to measure the world, and their findings would help define the meter as one ten-millionth of the distance between the pole and the equator--a standard that would be used "for all people, for all time." 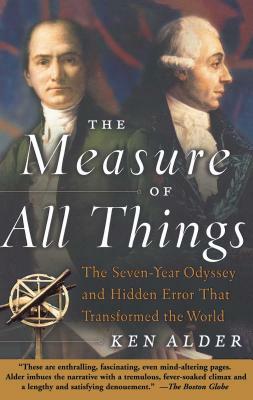 The Measure of All Things is the astonishing tale of one of history's greatest scientific adventures. Yet behind the public triumph of the metric system lies a secret error, one that is perpetuated in every subsequent definition of the meter. As acclaimed historian and novelist Ken Alder discovered through his research, there were only two people on the planet who knew the full extent of this error: Delambre and M chain themselves.